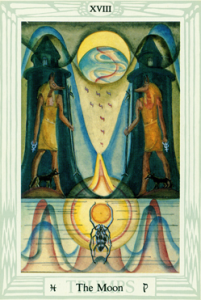 The Thoth Tarot trump for Pisces and the 29th path of the Tree of Life is The Moon XVIII. The esoteric title of the trump is Ruler of Flux and Reflux: Child of the Sons of the Mighty. Here we have a path that is half in shadows. At the top of the picture is the Sun, pushed through the darkness and cold of night towards the dawn by Khephra, the Egyptian scarab beetle. Khephra, like Amoun, is a self-created god. The beetle, like the butterfly, undergoes a series of remarkable transformations. At one point he seems completely inanimate, appearing as nothing more than a shell or stone. The scarab miraculously comes forth from the seeming inertia with wings on which to ride the breezes of dawn. Pisces is traditionally ruled by the planet Jupiter, known to the Greeks as Zeus and to the ancient Egyptians as Amoun (or ‘Amen’). Jupiter, Zeus and Amoun were originally gods of the mountain and of the seas and rains that replenish the earth with new life and growth. Amoun is a mysterious god. He is self-created, and his location, unlike the sky-gods Horus, Hathoor and Nuit, is below the horizon. He is ‘The Hidden God’. As the 12th sign and 12th house in astrology, Pisces represents the deeper realms of the subconscious mind. Psychology defines three types of consciousness. It has been argued that there is no such thing as an unconscious; if it is not conscious then it cannot be thought of as any kind of consciousness. The letter for Pisces is qoph or ‘Q’, which represents the back of the head and the medulla oblongata, the lowest part of the brainstem connecting the brain with the spinal cord. This is the primal root of the brain. In terms of consciousness, it is where the earliest memories are stored. If one could send consciousness backwards, from the frontal lobes of rational intelligence to the narrow passage of the medulla oblongata, one might be able to see all the way down to the base of the spine. There is evidence that once upon a time, homosapiens had a tail, as do most non-human creatures on our planet. A ‘queue’ is also a kind of tail. The long, sombre epic of mankind’s existence on the planet is yet another kind of tale—one that has been told in numerous ways by diverse cultures in all times. The 29th path of Qoph connects Netzach, the sphere of Venus, with Malkuth, the sphere of the visible universe and is imaged forth by The Moon XVIII Tarot key. 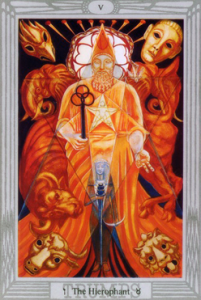 The title of the 29th path is the Corporeal Intelligence, so-called because it is concerned with the incarnation of all bodies according to the revolution of the Zodiac. The root of the word that is translated ‘Corporeal’ (gosham) implies a violent rainstorm or shower—the ‘shower of the life of earth’ that comes through the seed of the Unborn Spirit or Holy Guardian Angel in the ritual called the ‘Bornless’. The ‘seed’ is alchemical and refers to the fluidic or formless fire from which all forms receive their essence. The descent of this path is the incarnation or embodiment of each creature, while the ascent of it implies knowledge of the Occult Intelligences. The magical powers of the 29th path are of Bewitchments and Casting Illusions. The Qliphoth of Pisces is ShIMIRVN (Shimiron) ‘Malignant Women’, and may be found in The Flaming Sword under the number 616. Curiously, the number 616 is a number of the ‘beast’ of Revelation—the number was later ‘solarised’ as 666. The 29th path connects Venus, the lowest sephira on the Force side of the Tree, with Malkuth, the dead-end of matter. The women of malicious intent are phantasms of decaying (or thwarted) desire, rife with poisoning and corruption. As such, these ‘women’ are no more than blind forces, but have a tremendous capacity to inflict harm on the unwary human. ‘Hell hath no fury like a woman scorned’ is an aphorism that applies not only to the human but also to the elementar that is deprived of ‘blood’ or energy. The Intelligence of the path orders the neural and biological patterns that in turn influence the behaviour of species. When the human ego identifies personally with the biological urge to procreate or self-replicate—that force which is, in fact, an entirely impersonal machine or engine—all manner of psychological aberrations occur. The person seeking self-fulfilment in the production of offspring, and finding the result is nothing of the sort, may subvert or redirect the flow of life-force into other objects of desire. Typical afflictions are ‘eating disorders’, so-called—for devouring and begetting are dual principles of the Great Mother at the cosmic level. The predatory behaviour of both men and women, especially when it forms part of a group mentality, is another, less specific. Alcoholism is yet another trait, since it arises from a desire to be reabsorbed back into the stream of life from whence the organism was formed. It is the self-assertion of the ego, maintaining the delusion of an isolated life and existence that is the root of all ailments of the soul. All Qabalistic references are from The Flaming Sword Sepher Sephiroth.